People of today are probably too "worldly" or "ungrateful". As is known, almost every household has the experience of buying yummy chocolates from big stores; however, nearly everyone forgets about the material that is used to make them. Chocolates are made with the powders of cacao beans, which are the fruits of a tropical plant - the cacao tree. After Christopher Columbus discovered the American continent, the Europeans swarmed to America in an attempt to achieve their dreams of becoming rich. As a matter of fact, the Europeans did learn a lot from the new world, and they really made great fortunes by making use of the knowledge they learnt from the red Indians. For example, when the Spaniards arrived at Mexico, they found the local Indians use a kind of plant seed as money on the market. The money could be ground into powders and mixed with corn flours to make cakes, which was the most favorite food of the Indians. It was said that after eating such cakes, the person would cheer up and forget about fatigues. The Indians called the seed "chocolatuo", while the Spaniards called it chocolate. The trees that produce "chocolatuo" grow in primitive forests, but since they were scarcely distributed, even the local Indians could only find them in big forests. The Indians called the tree "cacaotuoli"; so the botanists of the later generation, based on the original pronunciation, gave the tree the name -"cacao tree". The Spaniards loved "cacaotuoli" so much that they shipped some back to Spain. They reported the miraculous effects of "chocolate" to their king. The king tasted "chocolate" personally and instructed his colonists to collect the seeds of cacao trees in large amount. Afterwards, Spain established the first chocolate manufacturing factory in the world. For more than 100 years, the Westerners continued to improve the chocolate processing procedures and made chocolates into hundreds of varieties. As a result, chocolate plays a more and more important role in enriching the foodstuff of human beings. 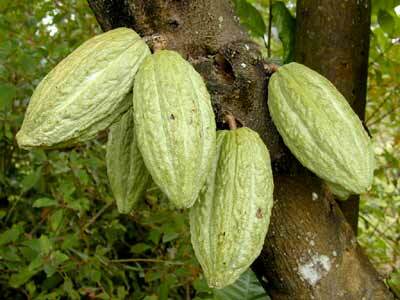 Cacao tree is a kind of small arbor tree and it has the following outstanding features. First, cauliflory: its flowers burst open on the tree trunks directly and then the flowers will produce fruits on the tree trunks too. The cacao flowers are small, but the fruits are big. The fruits are elliptical and have many ridged lines on the outer skins. The color of the fruits is yellow, and each fruit can grow as heavy as one kilogram. Each cacao plant can grow 60 to 70 fruits, and there are about 30 to 50 seeds in each fruit. The raw materials of chocolate come from these seeds. The seeds of cacao contain a kind of cacao butter, which is solid under normal temperature but may melt away when the temperature reach 37(C. The temperature in the human mouths is 37.5(C, so the chocolates made with cacao butter will melt when they are placed in the mouths. "Only melting in the mouth instead of the hands" has become a famous advertisement lyric of the chocolate manufacturers. Chocolate butter has great thermal capacities. Before a doctor is going to have an operation or a pilot is going to a new flight, if he or she has some chocolates, he or she will keep hearty vitality for quite a long time. Besides, cacao powder is rich in protein content, which has the effect of cheering up the spirits. This is why it is often used to make high-rank drinks. Tea, coffee, and cacao are the three major drinks of the world. Tea originates in Asia, coffee in Africa, and cacao in America. It seems that such a situation is a skillful arrangement of nature. However, no matter in which part of the globe they originate, all plants are the common wealth and also serve the common good of human beings.